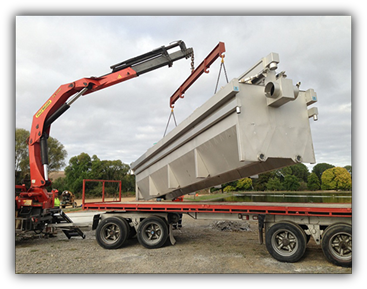 The TOVEKO® is ideal for small to meduim industrial and treatment plants in New Zealand. The TOVEKO® continuous sandfiltering system provides an excellent option for economical operation and space saving. Incoming water flows into a longitudinal inlet shaft and is distributed evenly across the filter bed by inverted V-notch openings along the length of the filter. The inlet shaft is taller than the main filter body and this provides the 650mm of available head across the filter bed. Solids are filtered from the water and the clean water overflows above the filter bed via V-notch openings. TOVEKO® filters continuously clean the filter bed whilst in service. An airlift pump transfers dirty sand from the base of the bed into an inclined, traversing screw-type washer located above the filter bed. Inside the washer, the individual grains of filter sand rub against each other in a counter-flowing stream of wash water. This vigorous action makes the sand washer highly efficient, enabling it to handle sticky solids that defeat other gravity-flow sand filters. During normal operation, the filter stops and starts automatically as the incoming flow stops and starts. 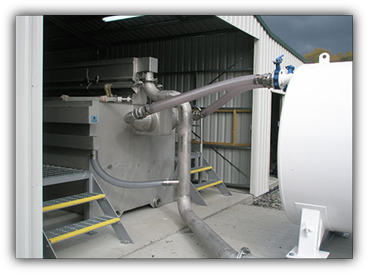 In periods of high flow and/or high solids load, the rate of sand washing automatically increases when necessary to ensure that the filter bed remains clean at all times. This makes TOVEKO® filters largely self-compensating and suitable for remote sites.